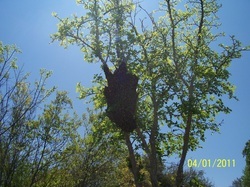 Do you have a swarm or hive on your property that you would like removed? We can help! We can move the hive to a different location - both for the safety of your family and the preservation of the hive. Our goal is to do live bee removal so that the bee population can continue to grow and prosper in this area. We do charge for the bee removal service due to the amount of work involved. Please call for prices as each removal situation is different. You can reach Johnny Duke at 512-228-2886.